The U.S. Army has long been known for its so-called can-do spirit, but optimism about the ability to succeed in any mission is waning. Senior Army leaders are warning the size of force and tight budgets are creating an unthinkable possibility of sending soldiers into battle who are not fully prepared. 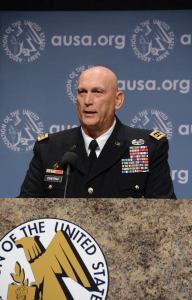 “Military risk is accumulating exponentially,” Army Chief of Staff Gen. Raymond T. Odierno said in October during AUSA’s Annual Meeting and Exposition in Washington, D.C. In 2012, Army leaders took a look at the world situation and decided the active duty force could drop to 490,000 people. Two years later, Army officials declared it could go even lower, to 450,000, as a way of coping with the deeper cuts resulting from sequestration. 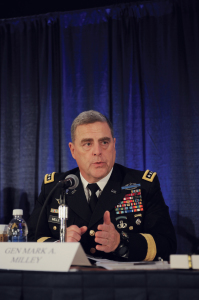 Army Secretary John M. McHugh, speaking at the same meeting, said the Army has been cutting soldiers “about as fast as we can.” He cautioned that deeper spending cuts would likely fall in readiness-related programs, such as training and maintenance. 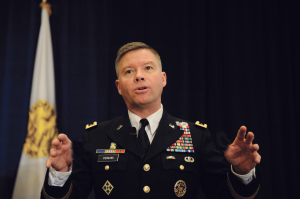 For 2015, McHugh said he thinks the Army has enough funds to balance its programs. For 2016 and beyond, he isn’t sure. Gen. Vincent K. Brooks, commanding general of U.S. Army Pacific, said budget uncertainty is causing “angst in the ranks.” “We are not sure, our soldiers are not sure, what is going to be there for them,” Brooks said. A new Army Operating Concept, unveiled at AUSA’s meeting, is designed to help move the force in the right direction. 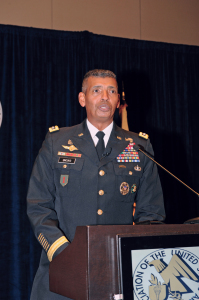 “The Army has to be constantly learning, adapting and innovating,” said Gen. David G. Perkins, commanding general of U.S. Army Training and Doctrine Command. “The Army as an institution has to have a way to learn and innovate, and so we are building that capability.” The aim, he said, is to get away from reacting “in fits and starts” to changes in funding in contingency budgets or overall funding, and to instead look at the overall national security needs. The key, Perkins said, is the Army can, with innovation and leadership, adapt faster than the adversaries and enemies. Everybody—active, Guard, Army Reserve and civilian—will be playing a part in keeping the Army ready for global operations in 2015. While an undercurrent of tension between the components has increased because of budgetary pressures and force realignments, Army leaders are resolved to get everyone working together. Army officials haven’t forgotten the importance of civilians. Under Secretary of the Army Brad R. Carson said civilians are “indispensable” to the Army’s success and pledged more support. “I need your help, your ideas, your passion and your commitment,” Carson said as he addressed the civilian workforce, promising improvements in mentorship programs and in training and development courses. Lt. Gen. Jeffrey W. Talley, Chief of Army Reserve, unveiled Rally Point 32.1, the newest version of a strategic document to set a path for the Reserve. He calls it a response to a complex security environment and uncertain fiscal outlook. “The Army Reserve represents most of the Army’s medical, logistical, transportation, full-spectrum engineering, civil affairs, legal, and chemical capabilities,” Talley says in the document, calling for Reserve soldiers to “stay sharp” in their fields through employment in the private sector and through career development. The Army is looking to the Pacific and to Europe to maintain old alliances and build new ones. It will do that largely through deployments. In the Pacific, the Army intends to continue two- to three-month deployments under a program called Pacific Pathways, Brooks said. The deployments are “part of our engagement structure and strategy,” he said, and support the administration’s pivot from the Middle East to the Asia-Pacific. The exercises also are economical, proving less expensive than permanent basing. They began this past fall in Indonesia, Japan and Malaysia. 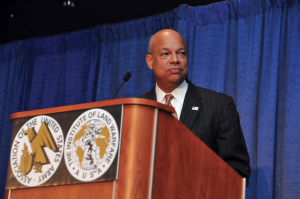 Three more Pacific Pathways deployments are planned for 2015, Brooks said. As the Army draws down, such exercises are more important than ever, Brooks said. It will take great cultural and generational shifts, however, to fill the “void of trust” some countries hold against the U.S., he said. Similar deployments are underway in Europe, with soldiers taking part in exercises in Estonia, Latvia, Lithuania and Poland. Designed to be part of training with NATO allies, the European deployments have taken on new meaning with unrest in Ukraine. With fewer than 32,000 soldiers now permanently based in Europe—down from a peak of more than 300,000 during the Cold War—rotational units taking part in multinational exercises is a way of maintaining trust and experience, Army officials said. Critical thinking is a key element of Win in a Complex World, the newest Army Operating Concept. Released this past October as a guide to shaping the Army for the period of 2020 to 2040, the push is to make smart thinkers. The idea isn’t to create an Army full of doubters and soldiers reluctant to follow but to encourage critical thinking so that people who find themselves in new situations can adapt. “Because we know the world is unknown and constantly changing, you cannot possibly control compliance with everything,” Perkins said. Army culture leads many soldiers to believe they can operate without sleep, but studies have found less than six hours’ sleep for six days in a row leads to a cognitive impairment of 20 percent, Horoho said. That is about the same as a blood alcohol content of 0.08 percent. “We would never allow a soldier in formation with a 0.08 blood alcohol level,” she said. Army officials expect it will take two years to complete the Cyber Branch, a cadre of skilled soldiers who will work on cyber protection, combat support and combat mission teams in addition to other duties. The branch is expected to have about 6,000 soldiers. 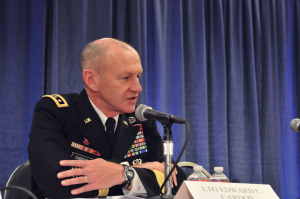 Lt. Gen. Edward C. Cardon, commanding general of U.S. Army Cyber Command, said 2014 was a year of a lot of progress, but there is a lot left to do. “We are about a little less than halfway built,” he said, describing progress in building cyber capabilities at the corps level and below. The headquarters for the new branch, the first formed since the 1987 creation of U.S. Special Operations Command, will be built at Fort Gordon, Ga. Construction won’t be finished until 2018 at the soonest, but the mission won’t wait. One way of filling the branch has been in-service recruiting, Cardon said, but the Army will have to go outside to fill all of the billets. Because training is expected to take 18 months, the Army has been getting advice from private-sector technology companies on how to identify people with innate computer skills in addition to recruiting those with information technology-related education. 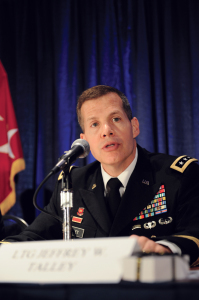 While cyber attacks are a clear concern, Cardon said the expansion of Army networking has been a significant benefit. Company commanders have at their fingertips resources that were only available at the division level a decade ago, he said. Military and law enforcement officials convened at the annual meeting to discuss the roles of the U.S. military in border security. Brig. Gen. Jon S. Lehr, commander, Joint Task Force North, U.S. Northern Command, staved off misconceptions about DoD’s actual role by saying they don’t perform law enforcement operations but provide support to those who do. They are asked to do what they do; they don’t come up with their operations. The “last line of defense” must be provided by the U.S., said Brig. Gen. Andrew E. Salas, adjutant general of the New Mexico National Guard, since the Mexican military’s capacity is limited. The National Guard plays a considerable part in this, providing support to law enforcement such as air support, land forces, transportation and ground surveillance. 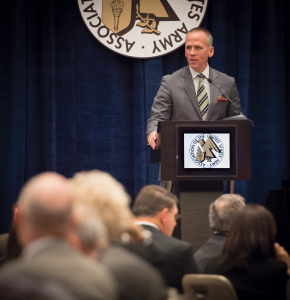 Leaders from West Point, U.S. Army Combined Arms Support Command, Rowan Technology Solutions and the Army Logistics University came together at AUSA’s annual meeting to discuss learning in the digital age. Since the use of iPads, digital instruction and e-books is expanding on post, Trainor discussed adapting to digital learning at West Point with two major goals in mind: equipping cadets with the knowledge so they graduate with a comfortable sense of technology, and maintaining a digital library that cadets can continue to rely on as commissioned officers. The academy began transitioning into the digital arena by installing wireless connectivity throughout the post, investing in software, updating textbook material and creating interactive learning material. The move to digital allows cadets to have access to a wider range of learning tools, such as digital notes, instructional videos on otherwise dense subjects and interactive maps, providing a “truly interdisciplinary” learning environment, Trainor said. “We can put that there in our knowledge what works so we can share, we can archive it, we can search it later if someone gets into a similar experience. We can really build that knowledge,” he said. “The skills of the Army civilians are as much needed as those of our formidable military force. This is not easy work, and it is not work that is going away,” said Carson, the Army’s chief management officer. For example, more than 1,000 civilian workers deployed to Afghanistan. They “often face the same dangers as our soldiers,” the Under Secretary said. Improvements are needed in the support system for Army civilians, he said, pointing out that “mentorship is not routine” and there isn’t enough leader training and development. Another issue is the lack of a “pervasive enterprise-wide civilian retention plan, or comprehensive talent management program,” he said. 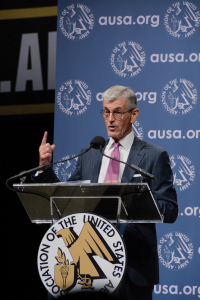 “Today’s military must plan and train for missions that are not necessarily lesser included functions of warfighting but are every bit as important,” retired Navy Rear Adm. Donald P. Loren said at AUSA’s annual meeting. Those “lesser included functions of warfighting” referred to chemical, biological, radiological and nuclear (CBRN) threats as well as weapons of mass destruction. “The threat of global nuclear war has become remote, but the risk of nuclear attack has increased,” Loren said, quoting the 2010 Nuclear Posture Review. “I can’t leave AUSA without talking about winning in a complex world,” said Maj. Gen. Leslie C. Smith, commanding general of the U.S. Army Maneuver Support Center of Excellence. “We have to work collaboratively to develop solutions,” Smith said. “We all know it takes everybody to make this thing happen.” He provided examples of how his team is developing those solutions, citing the development of doctrine, equipment, urban search and rescue, laboratories, and robotics. He also acknowledged the importance of making sure task forces remain accredited while keeping training cost-effective. “The nation and the American people need the CBRN response enterprise now more than ever,” said Robert G. Salesses, Deputy Assistant Secretary of Defense for Homeland Defense Integration and Defense Support of Civil Authorities. He also acknowledged that it takes a lot to keep that system running, underscoring the importance of the military and government working together. Domestic missions provide a unique opportunity for the Army, Salesses said. Soldiers are given the chance to work within their communities, increasing their professional skill sets. “It’s a tremendous opportunity working here domestically, and that, in my view, contributes to overall readiness in the military force,” he said. 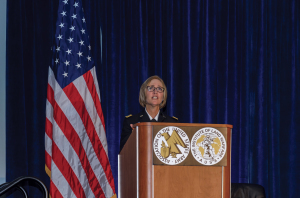 Supporting civil authorities when disaster strikes in the continental U.S. was a priority expressed by Army and civilian leaders at AUSA’s annual meeting. AUSA’s Institute of Land Warfare and the Department of Homeland Security hosted a breakout panel, “Defense Support to Civil Authorities: Responding to America’s Worst Day,” in which leaders talked about how to respond to domestic crises. They used a series of earthquakes in 1811–12 along the Mississippi River as historical examples of what needs to be done to get it right if it happens today. Participants included Robert J. Fenton, the Federal Emergency Management Agency’s assistant administrator for response, and Arlington (Va.) County Fire Department Chief James Schwartz, who spoke about the interaction between local and federal first responders at the Pentagon on 9/11. Gen. Charles H. Jacoby Jr., commander of U.S. Northern Command, participated on the panel via Skype. He said he was pleased that homeland security was being discussed at the meeting.